מטבע כסף שבעה חטאי אובמה במצב כ-Proof שנת 2014 משקל אונקיה This round expresses the disenchantment many feel about Barack Obama's Presidency, and depicts what may be the true legacy of the 2009 Nobel Peace Prize winner. The seven sins are ObamaCare, federal debt, immigration, drone warfare, surveillance, Executive orders and finally, fiddling as the American empire burns. 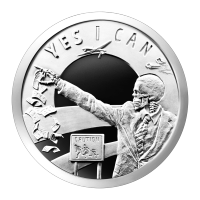 The obverse of this round depicts a skeletonized Obama with arm outstretched and money carelessly falling from his hand. The words "Yes I can" are at the top of the round, along with surveillance cameras and a drone. The bottom features a Caution sign with a family fleeing for their lives. The reverse shows the revised Silver Shield logo with the trivium in the centre encircled by the words "Silver Shield 1 Troy ounce 2014 999 Pure Ag" surrounded by 47 bullets. These rounds make a perfect gift and a political statement.